Saturday May 2nd at 8:00 pm in Lindsey Chapel, Emmanuel Church 15 Newbury St, Boston RSVP here via Facebook. Sunday May 3rd at 4:00 pm in Eliot Church of Newton 474 Centre Street, Newton, MA RSVP here via Facebook. 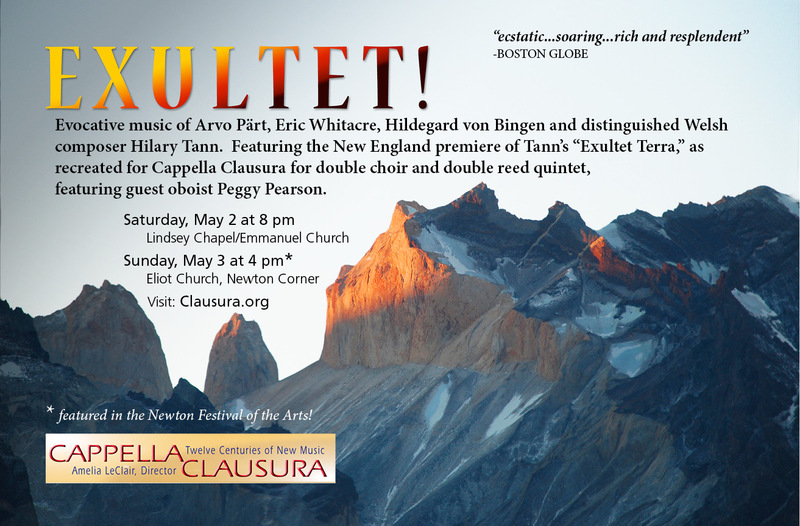 Featuring the Music of Hildegard von Bingen, Arvo Pärt, Eric Whitacre, and a premiere of Hilary Tann‘s exuberant “Exultet” for reed quintet and double chorus, arranged especially for Cappella Clausura, and with special guest Peggy Pearson, oboe. Hilary will be at each concert and will stay after each performance for a post concert talk-back with the audience. OR, you can get a serious discount if you buy tickets in advance. Because you’ve read to the end of this post and because you’re a friend of this blog, if you use the password FRIENDSOFKELLY at either of the links above, May 2nd or May 3rd, you’ll get advance tickets to either concert for just $10 each. That’s less than half price for a general admission ticket purchased at the door. The best part is that you can share this discout with anyone you like. Spread the wealth and invite your friends in on the deal too! @CClausura <– come visit us on Twitter for more news and discounts!